Is it difficult to get to Iceland? Not at all! Frequent flights operate to Iceland from main cities in Europe and North America and many gateways are served daily. Flight times to Europe are two to four hours. Most flights connect at Iceland´s Keflavík International Airport (45 km from Reykjavík) to give good stopover opportunities for transatlantic travelers. Thanks to the Gulf Stream, Iceland isn´t as cold as it sounds. Temperatures are moderate year-round. Average July temperatures are around 11°C in Reykjavík – the north and east are often the warmest parts in the summer. Snow is not the norm and only settles intermittently in Reykjavík but tends to stay longer in the north. Fine winter skiing areas are found on the higher ground outside many towns, however. Average January temperatures in Reykjavík, at around zero, are actually higher than those in New York. In the summer, light clothing is often all you need – but always be prepared for both cold and wet weather at all times of the year. The weather can be extremely changeable. Icelanders often say, “If you don´t like the weather, just wait 15 minutes.” And always bring a bathing suit, whatever time of the year you visit. A favorite pastime is year-round outdoor swimming in countless geothermally heated pools and lagoons, with a typical temperature of 25-28°C. Most Icelanders (especially those from their teenage years through their fifties) speak fluent English. In fact, they welcome the opportunity – so never be shy about approaching an Icelander. What are the accommodation and food like? Excellent! Iceland´s hotels and guesthouses are almost invariably clean and comfortable. The seafood and lamb are of outstanding natural quality and served in imaginative European style. There are also plenty of fast food establishments. Summer visitors who arrive at a bright midnight sky and ask when it gets dark in Iceland are sometimes told: “in the middle of August.” The sun barely sets in the summer in Reykjavík and it´s light round-the-clock in the north at the peak of summer. In mid-winter, expect only about four to five hours a day of daylight. Spring and autumn daylight hours are more or less “normal”. What is there to see besides nature? Nature is obviously a big part of the Icelandic experience – but it´s by no means the only part. Reykjavík is one of the liveliest, safest, most sophisticated and modern cities there is, and its nightlife and cultural activities have earned an exciting reputation. Other towns such as Akureyri in the north are worth visiting in their right too. For those who want to see both city and nature, the wilds begin just outside urban communities and a wide range of sightseeing tours are on offer from most of them. Will my mobile phone work in Iceland? Most European cell phones work on Iceland´s GSM network; North American ones use a different standard. But you can rent cell phones in Iceland. Iceland now has the highest rate of cell phones use in the world. Mobiles work in towns and on virtually all main travel routes. Iceland is an island of 103.000 km2 (39,756 sq.miles), about one-third larger than Scotland or Ireland. Its highest peak, Hvannadalshnjúkur, rises to 2.119 m and over 11 percent of the country is covered by glaciers, including Vatnajökull, the largest in Europe. Out of a population numbering more than 300.000, half live in the capital Reykjavík and its neighboring towns in the southwest. 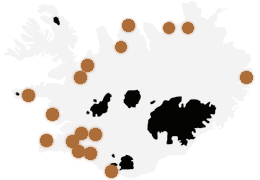 Keflavík International Airport has located about 50 km from the capital. The highland interior is uninhabited (and uninhabitable), and most centers of population are situated on the coast. Iceland was settled by Nordic people in the 9th century – tradition says that the first permanent settler was Ingólfur Arnarson, a Norwegian Viking who made his home where Reykjavík now stands. The Icelanders still speak the language of the Vikings, although modern Icelandic has undergone changes of pronunciation and, of course, of vocabulary! Iceland is alone in upholding another Norse tradition, i.e. the custom of using patronymics rather than surnames; and Icelander´s Christian name is followed by his or her father´s name and the suffix -son or -dóttir, e.g. Guðrún Pétursdóttir (Guðrún, daughter of Pétur). Members of a family can, therefore, have many different “surnames”, which sometimes causes confusion to foreigners! In 930, the Icelandic settlers founded one of the world´s first republican governments; the Old Commonwealth Age, described in the classic Icelandic Sagas, lasted until 1262 when Iceland lost its independence, and in 1944 the present republic was founded. The country is governed by the Althing (parliament), whose 63 members are elected every four years. four-yearly elections are also held for the presidency; President Ólafur Ragnar Grímsson was elected in June 1996 to succeed Vigdís Finnbogadóttir and was re-elected in June 2000. The head of state plays no part in day-to-day politics. Hvannadalshnjúkur 2119 m, Bárðarbunga 2000 m,Kverkfjöll 1920 m,Snæfell 1833 m.